Guide to statues | Boom Beach. All about the Game! It’s not a secret that statues are very important in the game Boom Beach. With their help it’s possible to increase Gunboat’s energy stock, resources reward for successful attack, attacking power of own troops etc. Statues in Boom Beach create Sculptor the building of which becomes available after upgrading the HQ to the level 5. Life (“green statues”) – this type of statutes aimed at increasing the production of resources. This type has 5 different kinds: increasing of all resources production, increasing the production of gold / wood / stone / iron. Magma (“red” ones). Main purpose of this type is to increase own troops attacking power. 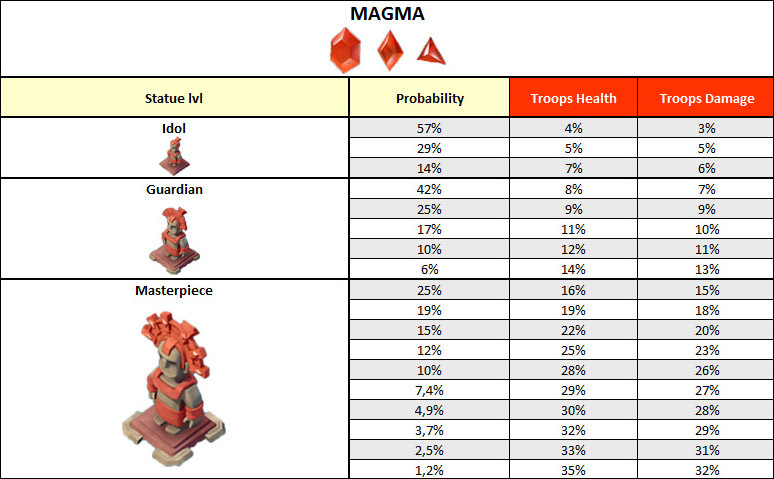 This type has only 2 kinds of statues: increasing of troop’s health and damage power. Ice (“blue” statues). With the help of this type we can improve own base defense. There are also only 2 kinds of these type statues: increasing of building’s health and defensive building’s damage power. Dark (“purple” ones). 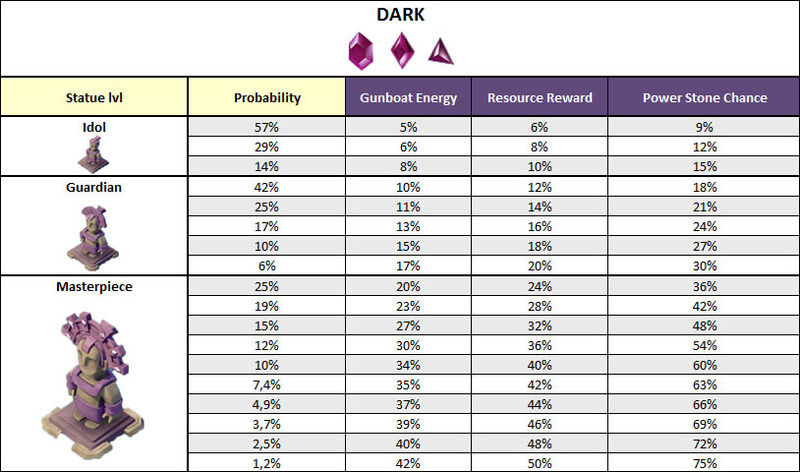 This type is aimed at the increasing of the Gunboat energy, resource reward and chance of getting power stone (3 kinds of these type statues). For creating statues Sculptor is using power stones. There are 3 types of power stones (fragments, shards and crystals) and 3 ways of getting them in the Game (as a reward for successful attacks, as a daily reward and with the help of submarine). 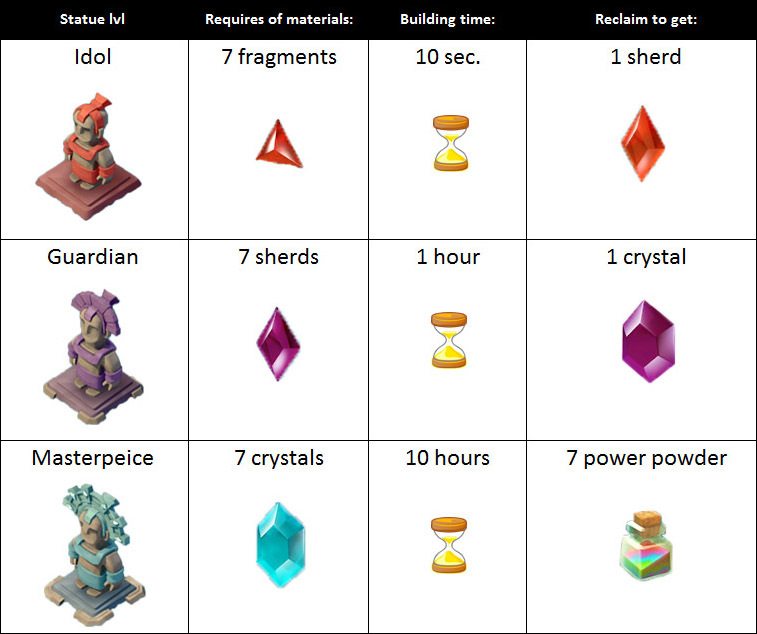 When the quantity of power stones is enough for statue creating we will see “Create” over the Sculptor building. It’s impossible to know what kind of statue is in process of creating and what characteristics it will be have until it’s finished. And of course we cannot choose it. 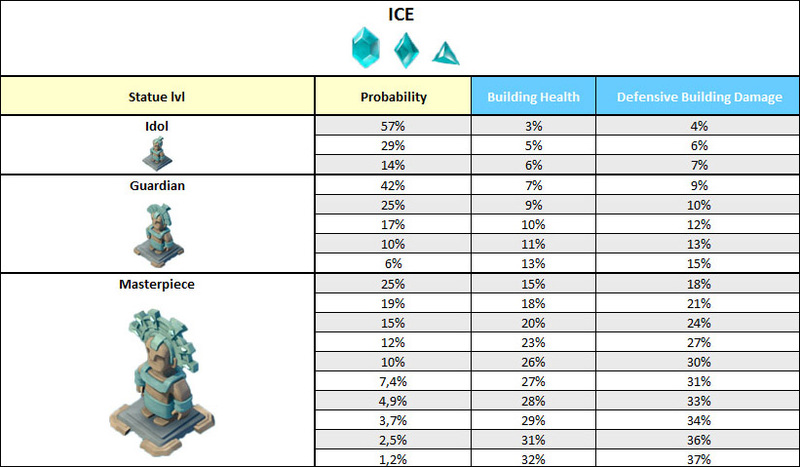 Below is provided information about probability of statue creating in Boom Beach depending on their characteristics (percent of improvements). The accuracy is about +/- 1%. 1. “Life” statues table (increase of resources production). The quantity of statues which can be placed on the island depends on the level of HQ and Sculptor but no more than 10. But there is one important limitation: we cannot place more than one Masterpiece of the same kind statues. And there are no any restrictions about of quantity of Idols and Guardians. We can have them as many as we want.